Blushing Beauty. 72 days. ALL AMERICA SELECTIONS WINNER. This pepper starts out ivory, then blushes to orange-red, and finally to deep scarlet. Thick-walled, heavyweight peppers are about 4 inches long and wide with great flavor. This is really a beautiful pepper at all stages. California Wonder. 75 days. 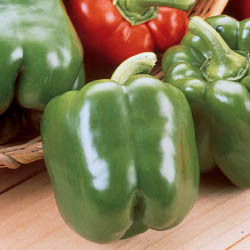 High yields and extra large fruit have made this the most popular open pollinated sweet bell pepper. They grow 4 inches long and 4 inches wide, with crisp thick walls and good taste. They start out green and turn red if on the stalk long enough. Golden California Wonder. 73 days. Great production of 4 inch by 4 inch thick-walled, meaty and sweet peppers. Golden yellow at full maturity. Carmen Hybrid. 2006 All-America Selections Winner. 75 days. Sweet Italian bull's horn type of pepper which matures at least a week earlier than other similar types. Beautiful 6 inch long and 2 1/2 inches wide. Jimmy Nardello. 80 days. Although actually a frying pepper, these are so sweet it is hard to get them to the kitchen without eating them. Absolutely delicious, bright red when ripe, 6-8 inches long. Wonderful for stir fries. King Arthur Hybrid. 72 days. Jumbo 5 inch perfect square green and red fruit when ripe. This is our favorite sweet bell for its ease of growing and beautiful fat peppers.